It's cold and dark and all I really want to do is curl up in bed, snuggle with my dog, watch movies and eat comfort food. But it's January and I'm trying to undo some of the comfort food eating from over the holidays. So, what's a woman to do? Actually, this is a pretty easy one for me because lighter comfort food is my specialty. I got this. A big bowl of spaghetti and meatballs sounded good this past stormy Saturday night. Coming right up... lighter style. 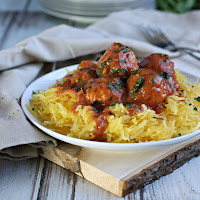 I actually love spaghetti squash any time of the year so there's no taste sacrifice there as far as I'm concerned. And meatballs made with ground chicken breast are also frequently on my menu. I pack them with good flavor and they're wonderfully tender. 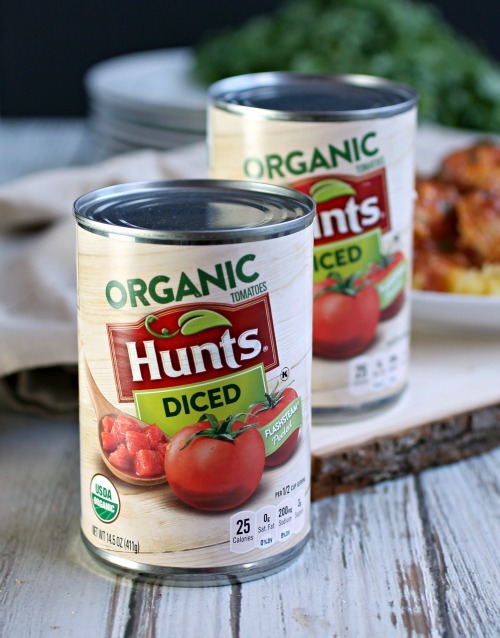 If you think chicken would be dry, think again because I added one of my favorite go-to pantry staples, Hunt's diced tomatoes. I like that they can their tomatoes just after picking and that they use steam from hot water to peel them rather than chemicals. * This meal is definitely going to be in rotation all winter long. Enjoy! 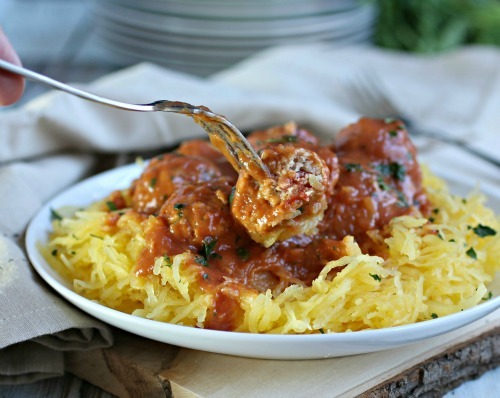 Cut the spaghetti squash in half lengthwise. Scoop out the seeds and place cut side down on a baking sheet lined with parchment paper. Bake in the oven for 45 minutes to an hour until it's completely tender. Using a fork, pull down the flesh and it will turn in noodles. Set aside. To make the meatballs, combine all the ingredients in a large bowl until thoroughly combined. Using your hands or a scoop (I used a 1 oz. scoop) form meatballs and place on a baking sheet lined with parchment paper. Bake in the 400 degree oven for 30 minutes. While the meatballs are cooking, make the sauce by adding the olive oil to a wide pot. Whisk in the flour and cook for a few seconds. Whisk in the chicken stock, milk and tomato sauce. Season with garlic powder, salt and pepper. When the meatballs are done, add them to the sauce, lower the heat and let them simmer for about 15 minutes. 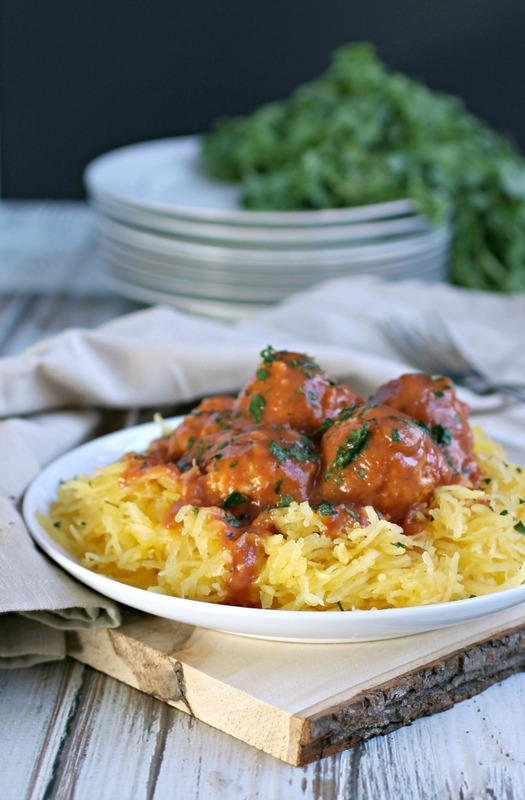 Serve over the spaghetti squash. The 2015 Dietary Guidelines for Americans recommend consuming 2.5 to 3 cups of vegetables a day, a goal almost 9 out of 10 Americans are not meeting. New research presented at The Obesity Society’s annual meeting found adding tomatoes to your meals and snacks can be an easy way to include more vegetables in your diet and get closer to USDA’s MyPlate recommendations.